Discussion in 'Antennas, Feedlines, Towers & Rotors' started by W9XMT, Apr 13, 2019. Because at HF frequencies (low frequencies, looooong wavelengths), very short, low-impedance runs to the ground reference point are possible, and stray RF voltages (and noise) can be suppressed effectively. Below is a graphic using NEC4.2 to show the effect of adding a vertical "ground wire" of varying lengths to the MW transmit system described there. The 90 mW of power shown in the graphic includes the power lost as heat in the r-f resistances of the loading coil, and the buried ground rod. 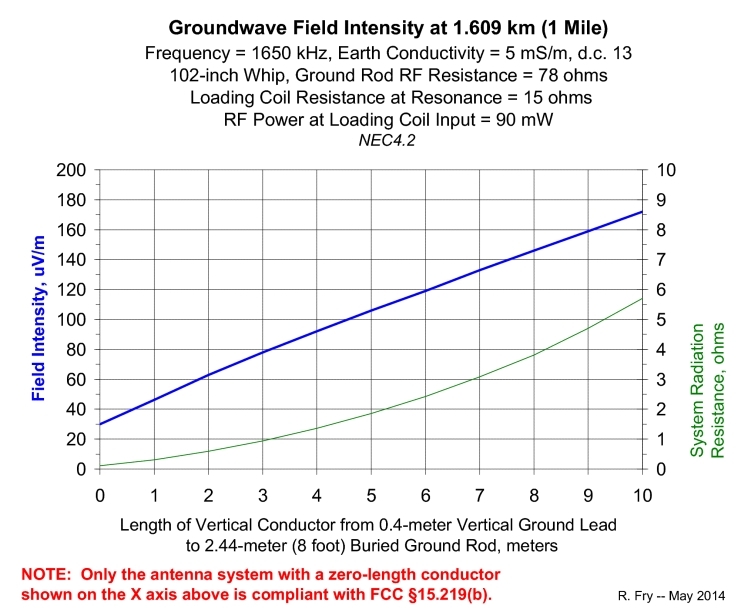 Increasing the length of that ground wire increases both the radiation resistance of the antenna system, and the field intensity it produces at a given distance (other things equal). Clearly, that ground wire is not a low-impedance path between the transmitter chassis/r-f ground terminal, and where it attaches to the top of the buried ground rod. Instead, it is one of the radiating conductors of that antenna system. The real problem with this is that your simulation does not correspond to observed reality. So... back to the drawing board. I'd politely suggest that your assumptions are wrong and rather than arguing about reality you form a hypothesis as to why. It is not immediately obvious from the labels on your simulation above, why it is terribly relevant because you are pretty obviously "jam loading" an antenna model to do something it was not really intended to do. On the other hand, I'm sitting at my station with before and after results that contradict the simulation. I seem to recall that the last time I had a similar disageement with KD6RF, I went up on a pretty tall ladder to measure shield currents on an end fed to try and detect the "high outer shield currents" he predicted with his faulty models. I'm not likely to do that anytime again, soon. To much to do at work right now actually getting paid to solve real problems. So, you have a simulation that does not predict what I'm seeing. Pretend I'm a customer (because I have been, of your previous firm, and a very good one) and explore why. Then we can discuss this further. The real problem with this is that your simulation does not correspond to observed reality. etc. Actually, it does correspond with the reality for this configuration as measured by the FCC during one of their field inspections of an unlicensed AM station. In this case, radiation from the 20-foot "ground" wire increased the field intensity measured 30 meters away from the antenna system from 19,700 µV/m to 73,800 µV/m, for the same applied r-f power from the transmitter. Sorry - no re-writtng of history allowed. You went up a tall ladder, made a measurement, and completely misunderstood and misrepresented the meaning of the measurement in a forum...... in an effort that provided data that roughly confirmed my claim of the validity of Kirchoff's Current Law at the feedpoint (what a shocker...). Several of us tried to help you understand what your measurement actually meant.... but I guess it didn't help. Your "rewriting history" chant is pretty old. As I recall, the last time you published this mantra I "went back in time" and pulled out your posts on the topic and demonstrated that you have a.. well... let's call it an evolving memory. So, not need to waste more time on that topic. It is what it is. Very interesting. But this does not correspond at all to the intent, design and demonstable success of my station grounding system, which provides a very good local reference for the radio chassis and equipment where all voltages on the various "grounds" entering them are kept nearly the same, including at the frequency of operation and down (lower frequency noise voltages). As previously stated, this has been VERY successful in suppressing stray RF "In the shack", particularly on 160, 80 and 40M, where it had been an issue previously, particularly for digital interfaces between the computers and equipment, including wattmeters, radios and attached waveform monitors. No "RF bite" to be found anywhere. This grounding system is ALSO attached to a dedicated EARTH ground" which, as I explained in a different thread, suppresses noise on the equipment safety ground when built as mine is. (dedicated parallel power to shack. shack ground rod array bonded to safety ground, equalized ground loops...etc.) Impedance to this local ground, at any significant frequency, is significantly lower than the safety ground, whose noise it suppresses hand whose noise is already low due to the dedicated run from the home entrance panel to the radio equipment - minimizes noise pickup from house loads. Lengths between equipment, including to the coax grounding block at the "shack" entrance" are very short and better than 1/10th to 1/100th of the operating frequency wavelength, and are closed with high-surface area conductors. Not my first rodeo in this. So... whatever it is you are modelling, it does not model this ground design, nor does it reflect it's effectiveness. And again, "Earthing" the ground is only partly responsible for its success. The intent is to equalize ground voltages locally, between equipment. Perhaps we shoud have a TIM to go over this and assign Action Items? I'll set up a conference room. However your happiness with the grounding system you described does not negate the truth/validity of the radiation of a "ground" lead as I described and documented it, and which was measured by the FCC in their citation I linked to. Ok. But it is irrelevant to my grounding application. There is no significant RF in the shack, the antennas are pretty far away and there simply is no significant outer shield current on the coaxes from the antennas and into the shack, as previously measured. I'm NOT talking about a 20+ ft long "ground" wire straight up to a VHF antenna. Which appears to be what you are trying to relate this to. Also... it would take a detailed and annoted schematic to really understand how the station grounding approach I use works, which would be the 1st step in building a decent model. Otherwise, too many "bad" assumltion. As shown in that table you are referencing, the operating frequency is 1650 kHz — which is in the medium-wave band. It is good that you like what you have installed. The levels are connected by other pieces of flashing going down the wall. At the bottom, this flashing is connected with 00 gauge wire about 6-inches long. That wire goes outside connecting to the first of several chemical ground rods that are 5-feet long and are also connected to the AC mains ground rod which is about 6-feet from the 1st chemical ground rod. All equipment is connected via short pieces of braid to the flashing immediately under the rear of the equipment. This arrangement does provide a satisfactory ground even on my 432 MHz equipment. Even running 1400-watts output on HF (my main amplifier will not quite make 1500-watts output), there are no problems with r.f. in the shack. Also, I have no TVI with any of the television sets in my house nor any TVI with my neighbors. I also do not get into any computer speakers inside my house including the speakers that are on my main operating console. A former neighbor, who lived next door and was a computer consultant, had, on average, at least 15-computers running at any time. He did have 1 of the speakers that would, occasionally, have problems when I was operating. That speaker was on the side of his house next to my house and was about 15-feet away from my equipment. I offered him ferrite, bypass capacitors, etc., to solve the problem. He refused saying that, when the speaker did get interference, he would just unplug the speaker. You can get 2-rods out of each 10-foot long section of copper pipe. Of course, the better the ground conductivity the better the grounding system. However, using a chemical ground rod helps considerably even with soils that do not have good conductivity to start. For those of us who have excellent ground conductivity, the chemical ground rods also help. One can purchase suitable chemical ground rods. However, those are pretty expensive. By making your own chemical ground rods, the cost is just a fraction of what it would be to purchase such "ready made". With vertical antennas, having elevated radials is definitely better than what most amateur radio operators are able to construct with buried wires. Unfortunately, having elevated radials is not always possible. In this case, readers again could be overwhelmed by Brian's long-posts-of-irrelevancies about stray RF, grounding straps at Bri's particular location, and what not .......... none of which is relevant to Richard's original post showing something that hams should be aware of - that an elevated "ground", or a "ground" at the end of even a fairly short wire, is often not a ground at all!